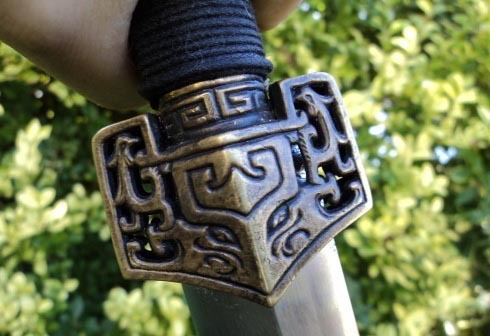 Good repros of Ancient Chinese swords are hard to find. 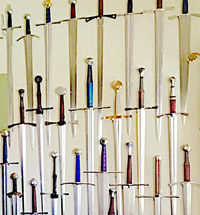 The only real choice for any kind of Chinese blades for years has been the Hanwei Forge, and while they certainly do offer some great swords, many serious Chinese blade collectors feel that there is 'something missing' from their offerings..
One of these collectors was Canadian Garrett Chan, but instead of just complaining, he decided to do something about it. 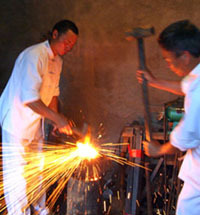 Working closely with a Chinese forge, Garrett created his own company - Jin Shi Trading - and in the last few years has gained a very loyal following in the Chinese Sword community for exemplary customer service and exceptional products. Before we look at the sword in question - a little background and history.. The Two handed Han Dynasty Jian was one of the more common Ancient Chinese Swords used during the Han Dynasty (206BC to 200AD) - and it was during this time over 2,000 years ago that the process of differentially hardening a blade (to produce a 'hamon' - which in Chinese is called a shuang xue "frost snow") was first developed. 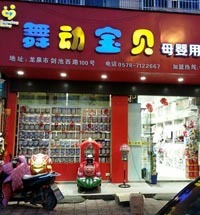 You can read more about Han Dynasty Swords and see some pictures of antiques here at Thomas Chen's website. Essentially then, to produce a truly authentic Han Sword - it needed to have certain characteristics, namely be two handed, have the traditional and ornate fittings and a differentially hardened blade with Shuang Xe..
And this is exactly what I received when I ordered one from Garrett..
Now as Garrett has each sword made to order, they don't arrive quickly - you need to be patient, sometimes for up to 3-4 months. And at $449.99, it's not as cheap as some of the competitions offerings - but then again they don't offer a lifetime guarantee against blade failure.. (you can read more about Jin Shi's guarantees and business principles here). So the big question is, is it worth the additional money and wait? Finally, the day came when the sword arrived - and I got to spend some time checking it out to find out for myself.. 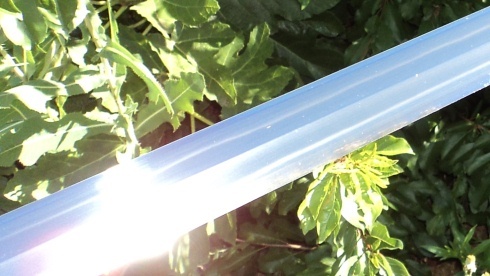 The sword arrived in a form fitting Styrofoam encased block. It took a little while to get a few of the bits and pieces of loose Styrofoam clear of the sword, but it was a small price to pay for the additional protection this shipping method offers and I spent some time just admiring how the sword looked seated in its scabbard. My first impression of the sword was how ornate and attractive it looked. It really did have a very solid appearance to it - this was no flimsy Wushu sword but a serious weapon that would have been at home on the battlefield. 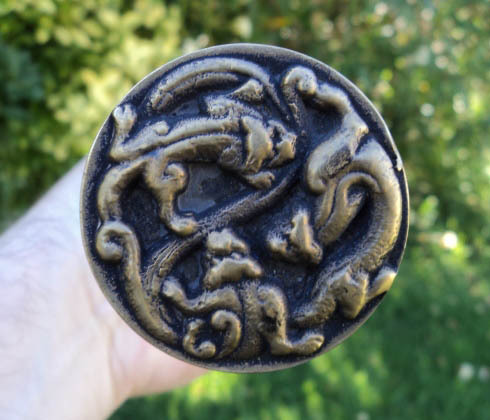 In the middle of the wrap you can see a detailed, cast brass ornament - and the base of the scabbard also features an attractive matching themed chape. While the fit between the scabbard and the sword itself could have perhaps been just a tad tighter, there isn't the usual kind of ugly gap I have seen on similar reproductions and really cannot complain about it too much (it will hold at a around 45 degrees below horizontal, but after which it will slip out if tilted further).. 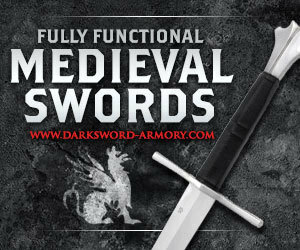 Overall, the sword in its scabbard has a very attractive, sleek look about it that is very pleasing to the eye. 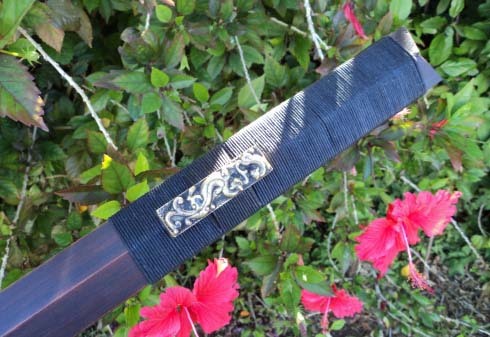 Now as mentioned, the hilt features a small hand guard that fits the scabbard with the same ornate traditional theme as the chape and the assembly is both very tight and nicely put together. NO shakes, rattles or looseness of any kind. 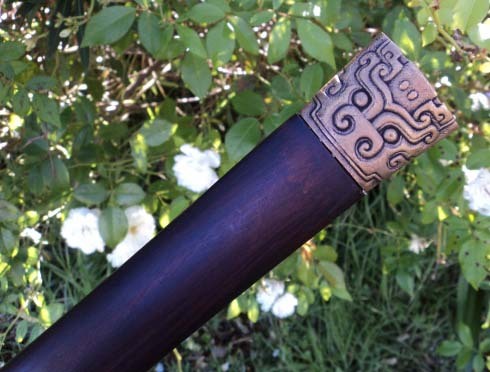 The wood core handle is wound in black cord wrapped from the guard down, doubling back on itself, and then forming a criss cross pattern on the upper half of the hilt. Unlike other Han Dynasty reproductions I have seen, this has been done tightly and properly - I recall handling one a couple of years ago priced at around $250 whose thin cord snapped off within a minute or two of dry handling (not to mention other troubles, such as an extremely rattly hilt assembly) but no shortcuts had been taken with this model. As we head towards the pommel, we find another unique and traditional point of difference from other reproductions, namely the use of a bamboo peg driven through the hilt to give it as much structural strength as possible (which is how the originals were made, and is an absolute necessity, as most modern reproductions have their pommels pop off from vibrations when striking a target). Because while the fittings are exceptional, the blade brings this sword to life! 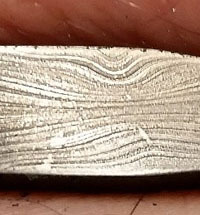 Now anyone who knows me knows that I have a penchant for T10 tool steel. 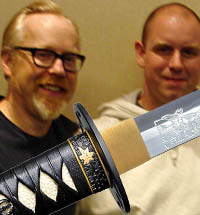 I use it exclusively for my line of SBG Custom Katana, mostly because in my experience anyway, I feel it is the best steel choice for a differentially hardened blade - expressing the balance between hard edge and flexible core, not to mention that it takes and keeps a very attractive hamon..
And I must admit, there is something very unique about drawing a sword with a DOUBLE sided hamon (ok, I will call it by the proper name - a double sided Shuang Xue) and I can only begin to imagine the amount of work it would take to clay and temper the sword like this..
Now of course, like all blades that are differentially hardened - the temper line shifts in and out of view depending on the angle it is held to the light. Sometimes it is very distinct. 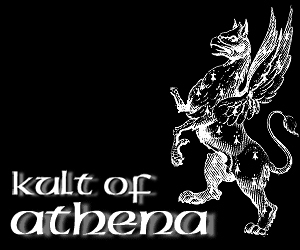 Sometimes you can barely even notice it is there - shifting like quicksilver. But while it is elusive, its true value is in the way it allows the blade to be harder at the edges, and thus take a much better sharpening (and keep it) than if was the same hardness of steel all the way through. And let me tell you, this blade is SHARP! But it is also extremely meaty, I've said it before and I’ll say it again, this is no flimsy thin Wushu blade! Put it all together and I actually found it VERY hard to put this sword down. One of the driving forces behind Jin Shi was to create Chinese swords that actually handle like the historical originals. And while I have never had the pleasure to handle any original antique ancient Chinese swords, I have handled a LOT of swords in general, but as far as sheer balance and handling goes, this sword is easily up there as one of my favorites. Weighing in at 2lbs 8oz with a point of balance 5" from the guard does not describe how it FEELS. 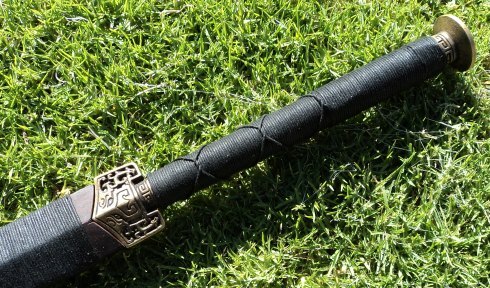 Take a swing with this sword and is WHOOSHES through the air. Hold it upright and it sits perfectly poised, ready to strike. Hold it out horizontally and you cannot feel the weight.. It's so well balanced that it is no trouble to wield with one hand. But bring the second hand into play and this thing comes ALIVE! You'll see what I mean in a moment when I do some test cutting with it - but in short, it feels more like an extension of the hand than almost any other sword I have had the pleasure of handling, almost as if it 'pours' out of the arm like water. Like I said, it was VERY hard to put down - the sign of a very comfortable handling sword indeed! All of the elements were aligned - the assembly is strong, the blade substantial and razor sharp and the handling almost beyond belief. The only thing missing was, I am completely untrained in ancient Chinese swords use or swordsmanship! But maybe that is not a bad thing, because if I can cut well with it - I can only imagine how happy this sword would SING if it was in the hands of someone who knew what they were doing! I started my tests with a basic paper cut - and as expected the blade sliced as sharp as any Katana ever has.. Thrusts through a water filled juice bottle were easy and required no effort to pierce deeply, the water pouring out until the blade was removed, whereupon the perfectly made incision closed up the hole: suggesting a very sharp tip indeed.. Cutting the bottles was no problem, just bring it down and watch them separate into two halves. 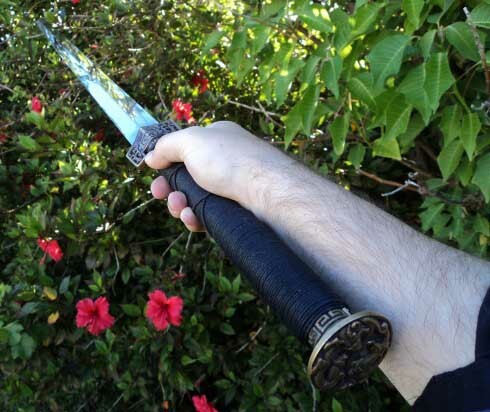 So then I took some tatami mats - full mats usually used for testing Katana - and began some cutting pratice..
One handed, two handed, the sword had no problems slicing them cleanly in twain. At one point my own poor form on a reverse cut saw the blade lose momentum halfway though a mat and bring it up in the air, but a second backhanded swing proved it was just me not being very familiar with this technique. This sword could easily lop off an arm or a leg - I already had a pretty darned good sense of this just from examining the blade and dry handling. But the question I wanted answered was, just how strong was the differentially hardened T10 edge? Here is the video of all these tests so you can see for yourself what happened.. I didn't hit it the pole all that hard, but the pole itself had some nice cuts in it - showing just how sharp and strong the edges are. 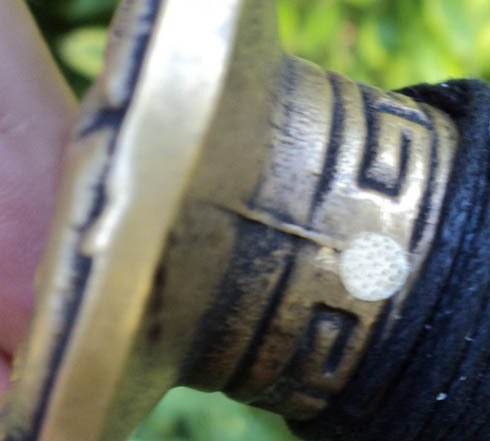 At first, I could not see any damage to the blade at all, but closer examination revealed a few minor dings. Overall, these were very minor and easily polished out. 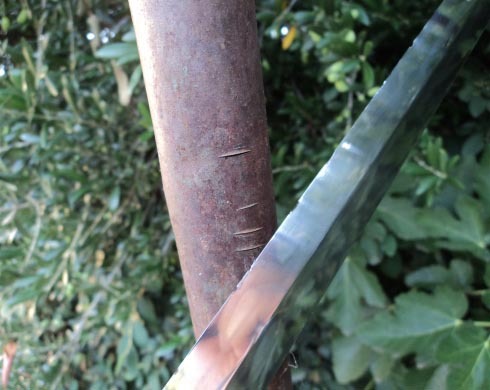 But the important thing was, there was no rolling of the edges or serious chipping (or worse, breakage) nor bending when the sword was struck on the flat. I was very impressed. The sword had passed all tests, and it was time to lovingly clean it back up because there was no way that I would want to destroy such a beautiful piece..
At $449.99 it's not cheap. 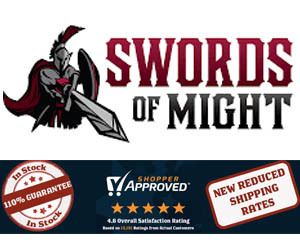 But by the same token, considering what you get - and the man who stands behind these swords - at $449.99 it is actually something of a bargain (they also have a non-differentially hardened option with a simpler scabbard for $299.99 - pictured below with the blade drawn next to the differentially hardened one reviewed here). The attention to detail is there, from the pegged pommel to the stunning razor sharp T10 blade. 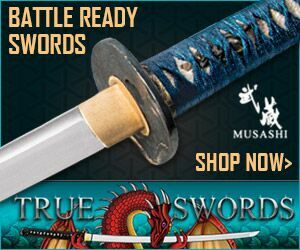 To the deep, rich color of the scabbard and the quality and assembly of the brass fittings - aesthetically and structurally this is a beautiful sword well worth both the price tag and the wait. If it was available straight off the shelves, I would think at $700 it would be a fair price. And that's without even factoring the handling! 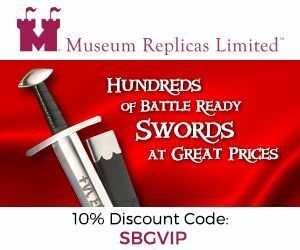 Get one of these and you'll know what I mean, they are the kind of sword that will last a lifetime - a serious and rare piece made with pride and backed up by a true gentleman. Overall, a really nice sword for the money! 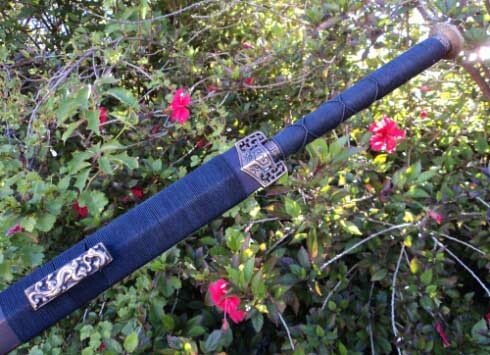 As mentioned, these swords are made to order and only available through Garrett Chan from Jin Shi Trading. 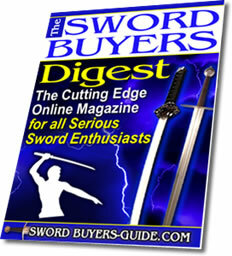 As noted on our Jinshi Swords Page, they are currently on hiatus and the sword is not available to purchase. But once this situation changes, we will update you all - so stay tuned. They are worth waiting for..